175,000 BTU Forced Air Heater Rental(Kerosene) – Mi-T-M – MH-0175-0M10, is available for rent in Rochester NY, Ithaca NY and the entire Western New York region from the Duke Company. 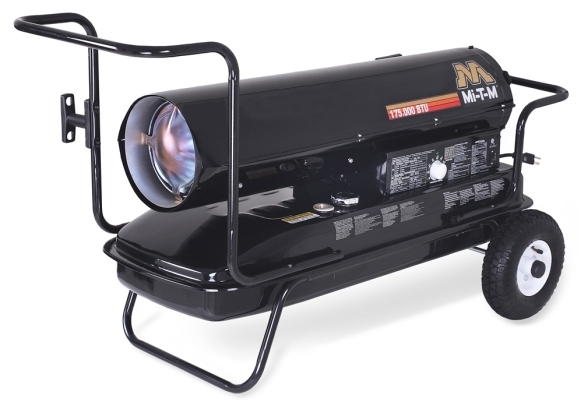 This Mi-T-M 175,000 BTU, portable, forced air, kerosene heater features a high quality enclosed electric motor, precision temperature control, performance fan and multiple safety features. Please see heater “Owner’s Manual” included with each heater for a complete list of important safety information. Not for use in residential living areas or inadequately ventilated areas. Proper ventilation required during operation. Heating Area: 4,300 sq. ft.